Ghost ants are the really small, two toned ants we find running in colonies inside and outside our homes and businesses in Hawaii. They usually have darker heads and thorax with an almost clear/tan okole. This species used to be one of the harder to control before the appearance of non-repellent pesticides in the late 90s. Because we use non-repellent products on the exterior of structures (were ants like to forage for honey-do from aphids on plants) we can bring the pest population down significantly with just one treatment. Back in the day, we used to treat these guys like we do now for big headed ants. You’d have to treat with a repellent product that will kill some of the go stands but would never really get back to the colony and the baits we had were not super helpful. However, we’ve gotten so good at taking care of ghost ants that we rarely need to come back for an interior treatment. There are also baits that have been introduced in the last few years that do a pretty good job on ghost ants as well. Ghost ants have a sweet tooth and some folks have a limited success with the clear sweet baits that you find at grocery stores such as TERRO. 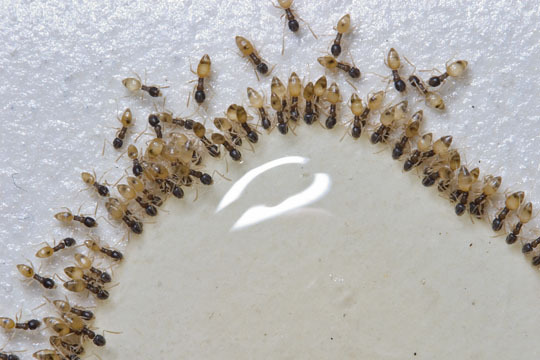 However, I find that since they generally are coming from a bigger colony outside most times you will need gallons of the product to effectively control the colon for long term ghost ant control. You may find it interesting that if you smash one of these ants, it actually smells like rotten coconuts! Thanks to Allen Chin-Lee for the sweet pic.